The earliest settlers of the Wolfsville community moved down from Pennsylvania about 1745, but it was another 100 years before Wolfsville Evangelical Lutheran Church was established. At that time, the Rev. Christopher Columbus Culler was pastor of the Funkstown Lutheran Charge. A native of Jefferson, Rev. Culler was a young schoolmaster who had studied theology under the Rev. Dr. Ezra Keller, founder and first president of Wittenberg University. In 1845, Rev. Culler organized a new congregation at Wolfsville and added to his Charge. The Wolfsville assembly consisted of perhaps 65 persons, predominantly members of the Marken and Kline families. Ground was broken for the new sanctuary in the Spring of 1847. Land was donated by the Samuel Marken family, who resided nearby in a small log cottage. The cornerstone was laid on August 1, 1847. The original stone church had separate front entrances, for men and women. 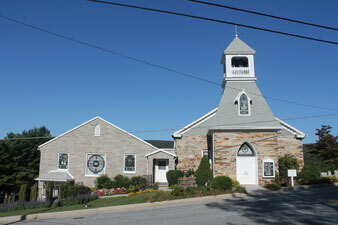 Over time, improvements and additions were made to the church, including a vestibule and bell tower in 1908. Today, St. Mark’s Evangelical Lutheran Church continues to serve its congregation as well as the local community.